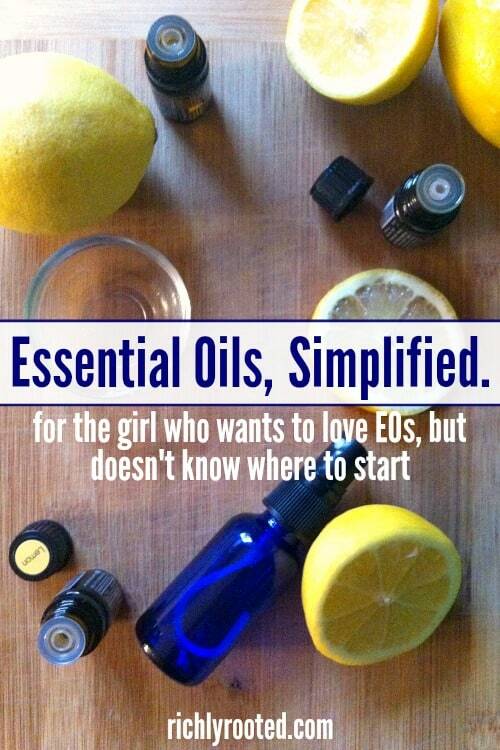 Want to get started with essential oils, but feeling overwhelmed? Here’s a simple guide to essential oils for beginners. This post is sponsored by Oils by Katelyn. Katelyn is wonderful to work with and has taught me so much about essential oils! I’m glad to pass on to you what I’ve learned! I’ve been in love with the idea of essential oils for several years, but I haven’t fallen in love with the actual oils until very recently. I found essential oils intriguing, promising…but overwhelming. With no idea how to distill the vast stores of information on essential oils into applicable, practical uses, I stalled with a hodge-podge of bottles from various brands, all barely used. I finally starting moving forward with essential oils when Katelyn Neil contacted me a few months ago. A former firefighter and paramedic, Katelyn now runs a work-at-home business selling essential oils and educating other women on how to safely use essential oils in their homes. Her passion lies in teaching, and I discovered that having her mentorship was the key to launching my own love affair with essential oils. So that’s my first and most important tip for anyone who wants to simplify essential oils: Get a mentor. I’ll be sharing things I’ve learned with Katelyn on the blog, but in the meantime you can find mentorship by joining any of the online get-togethers run by Katelyn or her team. 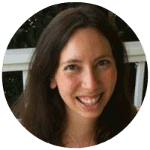 Katelyn’s essential oil education comes from Bastyr University, and her team includes a massage therapist, nurse, and holistic nutritionist. Check out the event schedule here. To join an event, simply pick the one you want to attend, then hit “Register” and fill in your information. When the event begins, you can participate either by dialing the number listed, or by clicking the link to enter the Zoom meeting room. These events will empower you to use essential oils properly and effectively. You’ll be able to ask any questions you have and get real-time advice. While you continue to learn about EOs and ways to use them in your home, here are some basics to get you started! What are essential oils and how do you use them? You can use essential oils by adding them to homemade cleaners and personal care products, applying to the skin, diffusing in the air, inhaling straight from the bottle, or in some cases taking internally. Before you use any oils, check the bottle for usage and dilution guidelines, and talk to your essential oil mentor or check a good reference guide. Special: Katelyn will mail you a free copy of the reference book Modern Essentials when you purchase the Natural Solutions Kit! 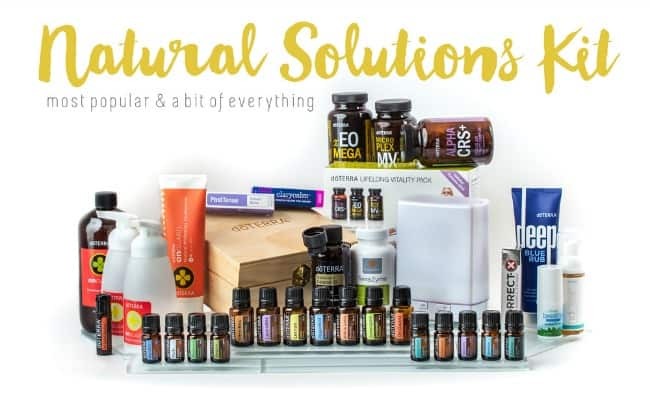 To get this kit, click the “Join doTERRA” button at the bottom of this page, and select the Natural Solutions Kit on the enrollment page. Never put an essential oil straight into the ear. Never put an essential oil in your eyes. If this happens accidentally, bathe the eye with a fatty oil like coconut or olive oil, rather than water. Read the labels on your EO bottles and use as directed. Do not take an essential oil internally unless directed on the label. If you develop a rash or dry patch after applying an essential oil to your body, stop using the oil and talk to your essential oil educator. You may need to dilute your essential oil more, or apply to a different area of the body. It’s also extremely important that you use quality essential oils from a trusted source. A few years ago my husband got an infection on his finger, and I picked up a cheap bottle of tea tree oil from a local health food store, having heard that tea tree has antibacterial properties. We were surprised when the oil burned my husband’s skin, and didn’t heal the infection! Later I learned that the quality of essential oils can vary wildly from one brand to another. Although their oils appear more expensive that what you’d find in the grocery store, doTERRA is a brand you can use with confidence because the company has rigorous standards for testing, sourcing, and processing their oils. When you compare oils, your dollar goes further with doTERRA, as most of the grocery store oils are diluted or made from a synthetic blend and won’t yield the best results. I’m really impressed by doTERRA as a company, both for their quality and for their responsible, sustainable practices. They’re involved in more charities and humanitarian efforts than I can succinctly list, but you can learn more on their website! You shouldn’t have to open too many cabinets and boxes and drawers to reach your oils. If you have to dig for them, you’re not going to use them much. My oils all live together in the linen closet, next to my medicine kit. They’re out of reach of my son, but easy for me to grab when I need. 2. Begin by enjoying the scents. Later you can learn about the amazing ways to apply and blend oils for various uses. But for starters, just enjoy their most basic, simple benefit: the aroma! Get to know your oils by opening the bottle and taking a whiff. You might be surprised that even that is enough to lift your mood or clear your head! 3. Add oils to what you’re already doing. You don’t need to come up with new recipes when you’re just starting out. Do you use a vinegar and water spray to clean your counters? Pick a scent you love and add a couple of drops of the oil to your spray bottle. Do you enjoy taking a relaxing bath? Add 3-4 drops of oil to the bath water. Prefer showers? Put 3-4 drops of oil on the shower floor, and you can breathe in the scent while you get clean. Do you use the oil cleansing method on your face, or moisturize your body with argan or almond oil? Simply add a drop or two of essential oil to your blend. 4. 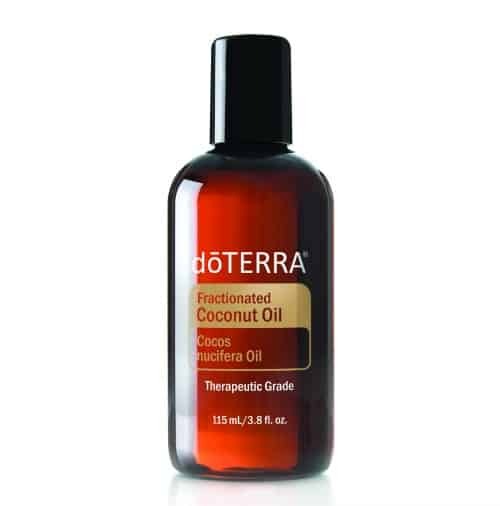 Use fractionated coconut oil as your carrier oil. Oftentimes when you’re applying an essential oil to your skin, you’ll need to use a carrier oil to dilute it (remember, they’re highly concentrated!). For this, fractionated coconut oil is your very best friend. Second to getting real-life support and advice for usage, fractionated coconut oil is my number 2 tip for simplifying essential oils. I’ve been using virgin coconut oil in my home for years, but fractionated coconut oil is a completely new “discovery” for me, and it’s making essential oil usage SO MUCH EASIER! Whereas virgin coconut oil is solid below 76 degrees, fractionated coconut oil always remains in liquid form. This is due to the manufacturing process which removes the long-chain fatty acids from the oil. Fractionated coconut oil has a long and stable shelf life, absorbs into the skin quickly, and won’t clog your pores. 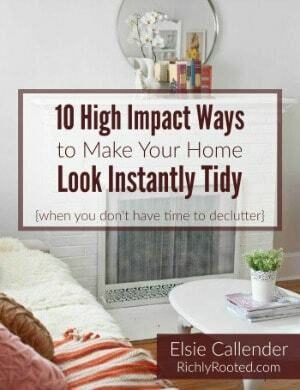 Best of all, it will not stain your clothes! I’ve ruined a few shirts due to coconut oil stains, even when I was being extremely careful. Because of its liquid form, you can put fractionated coconut oil in spray bottles and roll-on bottles along with your essential oils. So easy! 5. Get a few essential oil accessories. You can start out by simply mixing your essential oil and carrier oil in a small bowl as necessary, but pretty quickly you’re going to want something more efficient for dispensing oils. (Otherwise you’ll have about six different concoctions mixed up, and no more ramekins left in your kitchen–true story!) Invest in a few spray bottles and bottles with roller-ball applicators. It will be much less messy to apply your oil blends because you won’t need to use your fingers. Plus, these store and travel easily. Later, you can buy difusers, storage boxes, and other fun accessories, but the most basic way to start is with a few spray and roller-ball bottles. In the meantime, you can visit Katelyn’s website any time to purchase essential oils. The most cost-effective option is to get a wholesale membership (you pay a small yearly fee to get the discounted prices). You do not need to be a sales rep to get the wholesale prices, but if you do join the sales team there are additional bonuses and incentives available to you. What are your questions about essential oils? If you already use them, what’s your favourite oil? This post is sponsored by Oils by Katelyn. Katelyn is wonderful to work with and has taught me so much about essential oils! I’m glad to pass on to you what I’ve learned! I want to try Breathe. We love our lemon, lavender and OnGuard! I love learning more and especially the health benefits for my family. 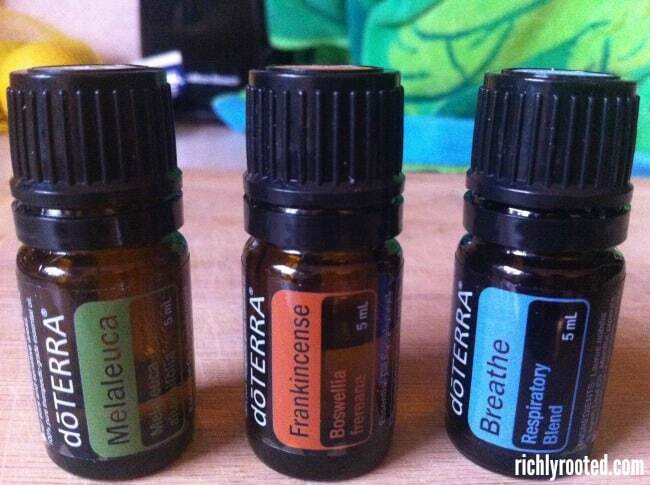 I have heard wonderful things about essential oils, but have not had the opportunity to try them! I’ve always wanted to try lavender! I use and enjoy so many oils. Today, I started using Wild Orange in a glass of water. I use Peppermint and Thieves’ on a regular basis, but there are SO many others I want to try! 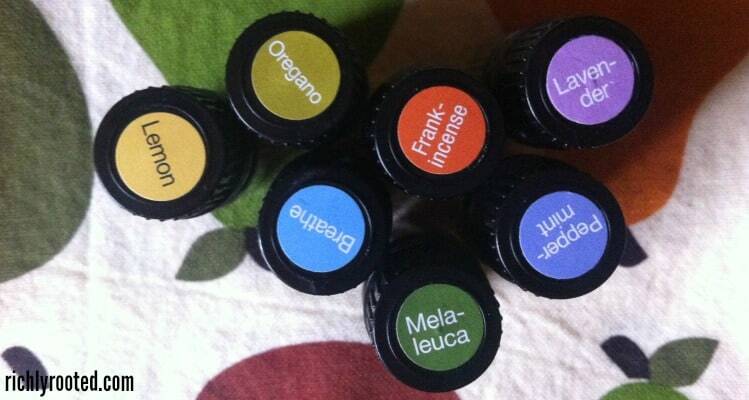 After seeing that video I really want to get Melaleuca and Oregano! I’d love to try Lavendar! I hear it’s supposed to be good for anxiety! I am interested in trying some essential oils to relieve daily headaches and help with insomnia.